Homemade granola is the best! I love the smell of roasted cashews and cinnamon in the morning. Such a nice way to wake up. Hello, Fall! I was able to visit Brazil in January of this year and took a trip to one of their markets. It was amazing! I was able to see the cashew apple for the first time which is native to Brazil and so may other native produce that I would never be able to see in Memphis. The good in this? Pepitas and cashews contain heart healthy fats and are a good source of plant based protein. 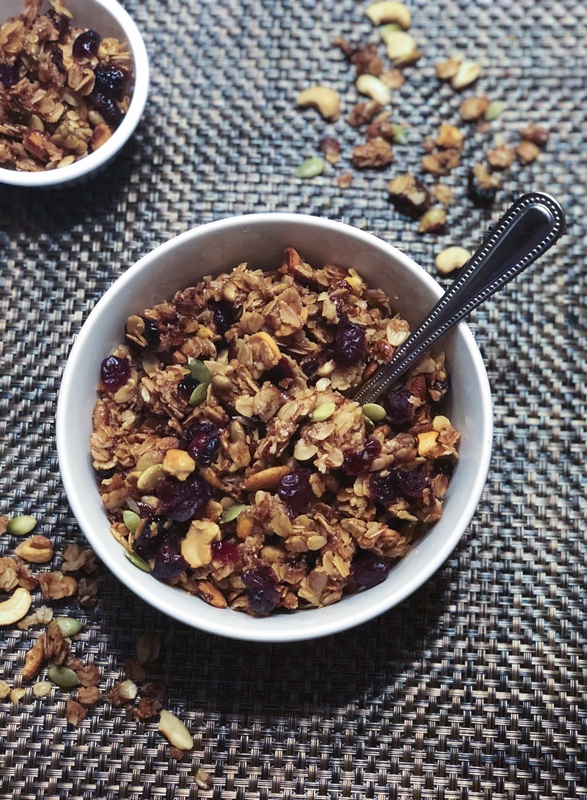 This granola can be used in a yogurt parfait, as a trail mix snack, or with milk for a quick breakfast. Combine honey, oil, cinnamon and salt in bowl and whisk to combine. In separate bowl, combine oats, pepitas, cashews and dried cranberries. Pour honey mixture over oat mixture and coat evenly. Spread granola on parchment lined baking sheet and bake for 10 minutes, stirring after 5 minutes to prevent burning. Let cool and crumble. Granola can be stored in airtight container in the refrigerator.